Note: If you have read my blog for long you will recognize this post. I had planned on posting a new recipe for Slow Cooking Thursday but do not have time to post it. I decided instead to repost one of my favorite crockpot meals, grits for breakfast. I hope you enjoy. For more great crockpot recipes see Slow Cooking Thursday. I am a northern girl. I am from the northwest. Being from OR, grits are not on my top ten list of favorite foods. Now that I live in a more southern state I have learned that grits are a staple to most people. My husband and girls love them and will eat them several times a week for breakfast. My husband though likes the real grits not the quick instant ones. He likes the stone ground yellow grits. He says that they stick with you better than the instant ones. I have tried to make grits several ways. I usually make them on the stove top or in the microwave. I have also tried them in the crockpot. When I tried them in the crockpot though I ended up with a dry, burned mess, that was just about impossible to clean up. I know others say it works great. But I have not had it turn out well. I have also tried cooking oatmeal in the crockpot. The idea of this is so appealing because you would have a nice warm breakfast waiting for you in the morning. Once again I ended up with dry, burned on mess. I came across a blog though that had a method for cooking oatmeal in the crockpot that I had never heard of before. She described how she basically gave them a water bath, similar to how you would cook a custard in the oven. This creates steam so the oatmeal would not dry out. I was very interested in this method. 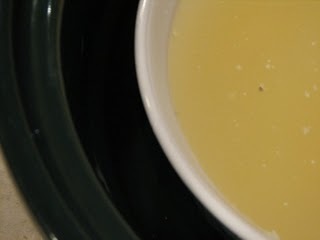 Recently on the blog crockpot365 she made grits. She made them the way I had done it before. She said they were good. I don’t know what I have been doing wrong. Others have it turn out well, but not mine. This inspired me though to try grits in the crockpot again, but I was going to try it the way I had read about making the oatmeal. I would place some water in my crockpot and place the grits in a bowl that fit in my crockpot. So, I used the crockpot365 recipe with the method from Ann. We loved the results. Even me, the person that really does not like grits, liked them. They were so good. They were creamy and smooth. We sprinkled a little cheese on them and they made a wonderful breakfast. My husband said he thought it was the best way to cook grits. He said the texture was perfect. I will definitely be making this again. We all thought they would make a great addition to our breakfast choices . And I like them because you have a nice hot breakfast waiting for you in the morning. I placed the ingredients in a bowl that fit in my crockpot. I filled the crockpot with a couple of inches of water. You want the water to go about 3/4 of the way up the filled bowl when placed into the crockpot. I then placed the bowl of grits in the crockpot that had a couple of inches of water in it. Place the lid on the crockpot. Cook on low for 7 – 8 hours. In the morning sprinkle with cheese and enjoy! Hi Lynn! What a neat idea—I’m glad that it worked out for you. I’ve done oatmeal in the crock before, but didn’t cook it for very long–and I didn’t have an issue with either the grits or the oatmeal drying up. I am *thrilled* that you found a method that worked for you and your family with minimal effort and clean-up! I’ll have to try this with oatmeal. I had the same problem you did with the burned up mess! I was SO disappointed! I agree with your husband about the yellow stone ground grits…much better that quick! I didn’t grow up eating grits in Ohio either, but have learned to enjoy them here in the south! Thanks for the idea! 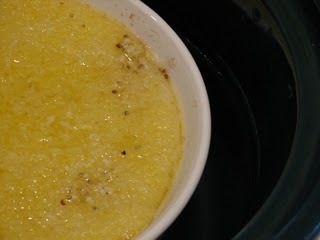 I’ve been wanting to try some crockpot ‘breakfast’ stuff but was afraid to…..and we love grits! I’ll have to try this. We’re now living in the south and one thing I haven’t ever tried is grits. Thanks for sharing. I’ve never had grits,must try this.have a great day. I'm from Maryland, but lived in Charleston, SC for a few yrs. Growing up we ate grits as breakfast cereal, with sugar, butter and milk. In the south I learned about savory grits, with any/ several cheeses in it. BUT THEN>>>> I learned to make extra, refrigerate overnight, slice and sauté in butter, and/or olive oil. Ohhhh Myyyyy… it reminds me of something my Gramma used to make called 'fried mush', made with white corn or hominy. It can be made with cheese or plain grits. Plain we serve for breakfast with syrup like pancakes. BUT… our favorite way to eat 'grit cakes' is with sautéed onions/ (red or yellow) bell peppers topped with boiled shrimp (and sometimes sliced sausages) for dinner. This can also be made with regular cheese grits. Either way it's wonderful, if not very healthy. For a shortcut, use polenta. Just don’t get the sun dried tomatoes for the shrimp recipe. It was too weird. Also, the crock pot on low with water in it makes great breakfast strata…eggs, veggies, sausage, bread and cheese, or what you like (made like bread pudding). This can also be done ahead and frozen or overnight in the fridge and baked the next morning at 350 till done in the middle. I do individual ones to speed the cooking. 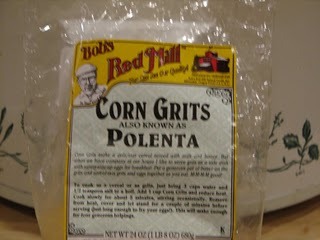 Donna, I have done grits/polenta in a loaf and sliced and fried it. It was good this way with sausage and cheese mixed in. I will have to try some of the suggestions you made. I have thought about doing a strata in the crockpot with the water bath type trick but I need to find a bigger dish. I think the dish I use for grits would be too small. I am glad to know it works though. Thanks for sharing. Oh I like this idea!! I remember my ex mother-in-law would fix whole grains in her crock pot overnight, but she only had it on low about 4 hours – so she’d put it on a timer to prevent it from being burned. I just haven’t wanted to mess with it but I like your idea better. I have a big crockpot (wide oval type) so I could easily do this. As for the strata – I’m not up to speed – isn’t that a “flatter” egg dish, like a flat oven-baked (usually) omelet that sorta puffs up?? Maybe like a pie plate in the crock pot, would that work to cook the strata in the crockpot? I’d really like to do something like that which won’t overcook the eggs, so as to have a hot egg breakfast but not have to use the aluminum non-stick pans. I’m trying to get away from using aluminum pans.